Howard S. Katz writes: The Federal Reserve is lying about the nation's money supply (M1). The current figure for money supply is being given as $1.6 trillion. The actual number is $2.34 trillion. The reported number is equivalent to an increase of 16% over the past year. The actual number is equivalent to an increase of 70% over the past year. This compares with the nation's high money-supply increase of 16.9% in 1986. These figures are from Federal Reserve releases H-6 and H-3. Plus the FOMC has increased the Fed balance sheet to levels never before seen. Banks are holding deposits at the Fed and not making a great deal of new loans (they are making some, but it is a recession after all). If the banks made new loans, that would generate more deposits to be included in M1. A demand deposit is money given to a (banking) institution that does not earn interest and can be withdrawn by the person who gives it (the depositor) whenever he wants (on demand). A time deposit is money given to a (banking) institution that earns interest but cannot be withdrawn except after giving notice for a defined period of time (usually 90 days). A time deposit at a bank should be thought of as similar to a certificate of deposit. You can't get your money out for a certain period of time, but while it is there, it earns you interest. Because of these differences, economists, for many centuries, have classified demand deposits as money but have said that time deposits are not money. A simple example will illustrate the point. Money is that economic good which can be used to buy things. Suppose you go to the store and see an item that you want. If you pull out your checkbook, which is a demand deposit, it will be accepted as money. But if you pull out your passbook to the savings account, then you will politely be told to take the passbook to the bank and get money for it. The passbook is not money (because of the time restriction on it), and you cannot buy things with it. Notice that the St. Louis memo tiptoes around the question of telling a depositor that he has a demand deposit while telling the rest of the country that he has a time deposit. It states, "Within certain legal bounds, such behavior is acceptable to the Fed." Well, since the Fed is trying to lie to the American people, I imagine that it certainly would be acceptable. The question is not whether the banks' behavior is acceptable to the Fed; the question is whether the Fed's behavior is acceptable to the nation. At least the memo is candid when it concludes, "Bank customers are unaware that such reclassification is occurring." According to the June 1, 2009, Federal Reserve release H-6 (table 3), demand deposits plus other checkable deposits are equal to $740 billion. But, according to the memo, this reported figure is only half of the real deposits. Thus the true number for bank deposits is $1,480 billion. Adding back the missing $740 billion gives us a money supply of $2.34 trillion (1.6 + .74). 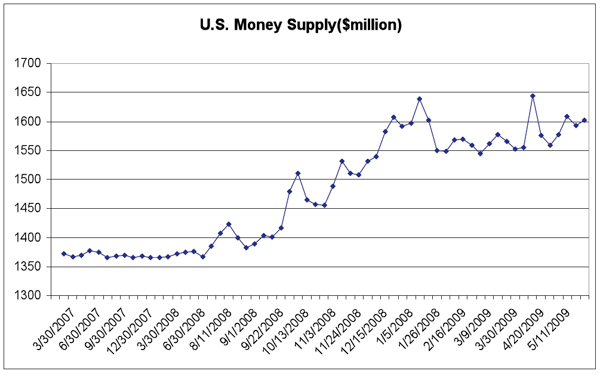 Calculating from the end of May 2008 to the end of May 2009, the US money supply has grown from $1.37 trillion to $2.34 trillion. This is an increase of 70%. 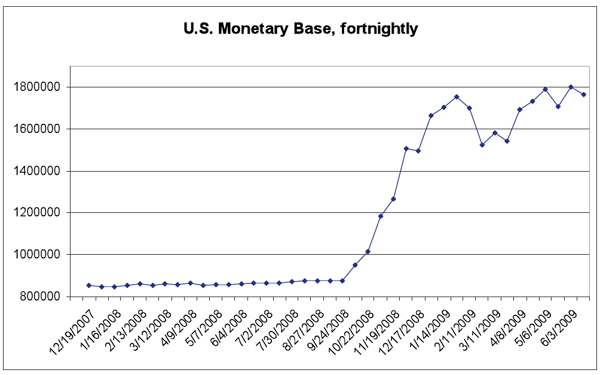 To put this figure into context, the previous high one-year growth in US money supply was 16.9% in 1986. The money supply figures for the late '70s, which gave us a 13.3% rise in the consumer price index, were in the range of 8%–9% per year. Barack Obama has projected a budget deficit for the coming year of $1.8 trillion. (To be honest, it seems strange to me to be using the T-word.) There is something that is not understood about budget deficits. We are always told that this is bad because it is borrowing from the future and that our children will be responsible for our debts. This, however, is an earlier-day lie. No government in history has ever been able to borrow the money for any sizable spending program from the people. 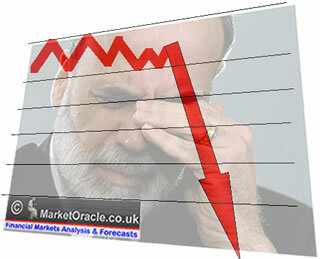 The government's deficits are simply too big and would overwhelm the credit markets of the nation. What every government has done when it faces sizable deficits is to simply print the money. If America is facing a $1.8 trillion deficit later this year, then it will probably print (another) trillion dollars to finance this. And then, as a political reality, it will be impossible to significantly cut the deficit for the next year, and the year after, etc., etc., etc. In this way, our children do not get poorer in the future. We get poorer, here and now. But we get poorer by having our dollars worth less. We have a bigger quantity of dollars but a smaller quantity of goods. This means printing of money (the Fed prints the money and then "lends" it to the Treasury) of $500 billion to $1 trillion addition to the money supply, each year for the next several years. A few years down the road, we could easily be looking at a money supply of $4 trillion to $5 trillion.. This is 3–4 times the level of a year ago. Last year practically every newspaper in the country was telling you that the problem we faced was "deflation." That was a gigantic piece of propaganda designed to frighten you into holding cash. Remember the flight to "safety" into T-bills and T-bonds? Most people fled from hard assets. These are the victims. They believed the propaganda of the establishment. When the debris of our collapsing society starts to come down, they will be its victims. Their assets will be "safe" in the US dollar as it loses its place as the world's reserve currency. Howard Katz — one of the early gold bugs of the late 1960s and '70s — was the head of the Committee to Establish the Gold Standard and worked with Congressman Ron Paul for the passage of the American eagle gold coin bill of 1986. His website is thegoldbug.net. Send him mail. Comment on the blog.